Rebalance. Damage does not stack insanely. Fix for December's Child. Fix over 3.0 for including wrong masters. Just threw in every damn legendary mod that could possibly make it onto a gun. Left out only the "blocking" mods. With my luck Bethesda will release DLC next week that lets you block with a gun. This should (finally) eliminate the several "hey, this weird thing that doesn't follow the rules just broke." Tested and found no need for separate files per DLC; ignore warning about missing plugin, name has changed. Rare but really bad (say it with me now!) race condition where you could potentially throw a weapon into a black hole. Added a metric f!ton of safety checks and fallbacks. Worst case is now a stream of "Blah Added" messages in your upper left. Equipping different items in the INV screen of the Pip-Boy rapidly (as fast as you can click) will cause the previous item to be reequipped, but all items are safe and will be restored even if processed out of order. Slow down there, Sparky. 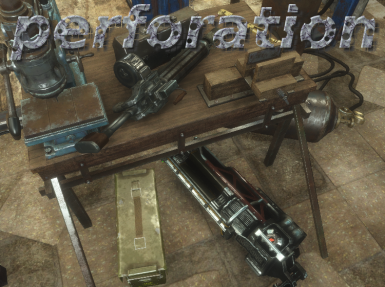 Unexpected bonus where, because a processed weapon is modded as if at a workbench, any untagged items when using stuff like Valdacil's tagging and/or DEF_UI icons will apply the tags and icons. Thanks to everyone who's left feedback and reported... Oddities. In addition to 100% less "throw weapon on floor" (tested with Final Judgement repeatedly), various weirdness with double-equips, or trying to process things that are neither guns nor automatics, is resolved. I'm removing the previous versions to be safe; script logic is the only thing that's changed. General script improvements for efficiency, quicker exit if we've already seen this weapon and nothing to do. Also, I'm a dumbass. 3D models for weapons now disabled while I process them. No more throwing your legendaries on the floor - or at least not as much. Reworked main routine for adding the mod. Now consistently applied to all weapons, Legendary or normal, vanilla or mod-added. Even Legendary variants of mod-added. Equip speed greatly increased. After first run, normal equip speed. Legendary weapons will, the first time per weapon per game, take a long time to scan. You may see it on the floor briefly. This is unavoidable; don't panic, it's still yours and it won't happen again. Something went wrong with the installer for 1.0.1, sorry. Should be working again. Seems the Nexus ate the update when I tried giving it the same version and description. Trying again. Just the installer's text and hidden perk fix, no functional changes. New file tagged as 1.0 - functionally identical, but fixed blank installer instructions and the perk not being hidden.